Here's one of those quick bread recipes that pops out of my folder when I see burstingly fresh zucchini at the produce stand. 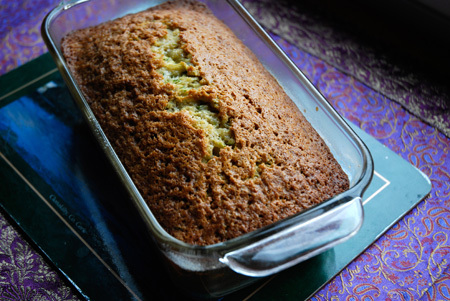 It's adapted from a recipe that's been passed around in my family as 'Doris Fenton's Zucchini Bread' for donkey's years and so, when I lightened up the oil and tweaked the quantities to suit, it only seemed fair to carry on the name. Note: If the zucchini is not fresh - either days old in the fridge or store bought - decrease the flour to 2 ½ cups. Zucchini fresh off the vine has more moisture. To grate zucchini cut in thirds and put through the cheese grater of your food processor. 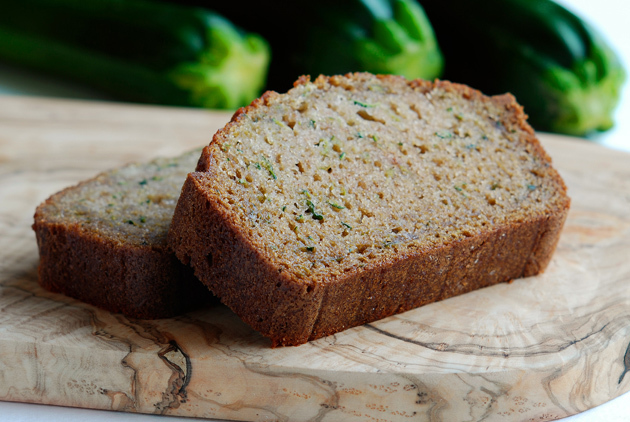 Freezing note: Make this zucchini bread now, when the zucchini is at its most flavorful, and freeze some for later. Wrap half loaves tightly in plastic, label and freeze in loaf bag. It's great months later when thawed for a feast! The bottom picture is excellent. Thank you for sharing this with us!